A number of weeks ago, we published a Critical Intel column titled "The China Syndrome". Rob Rath's piece examines the perceived issues game developers and filmmakers have reportedly dealt with in regards to including Chinese antagonists in their work, and the compromises made in order to localize media for the Chinese market. 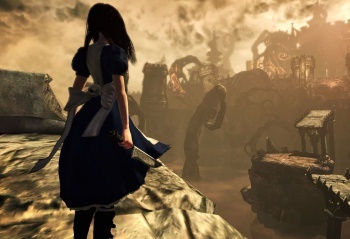 American McGee lives and works in China, and is the founder of Spicy Horse games, the company responsible for the popular American McGee's Grimm and Alice: Madness Returns. He has been involved with the videogame industry for nearly two decades, with credits dating back to early id games such as Doom II. So, when the opportunity presented itself to speak with him regarding our Critical Intel piece, and the country he calls home, we simply couldn't pass it up. What follows is the complete interview. Mike Wehner: American, first of all thank you for taking the time to answer some questions to give our readers a bit of perspective on just what it's like to live and develop games while being based in China. Our recent Critical Intel piece details some of the issues that both movies and videogame have had finding a home in the Chinese market. American McGee: Happy to participate. I'd like to start off by saying that my initial reaction to that article was that part of me wanted to write a response but another part of me felt that the writer's underlying agenda and/or complete lack of knowledge on the topic would make it a waste of time. Also, I don't want to apologize for China's internal policies - anymore than as an American I want to waste time defending the US engagement in never-ending global warfare. Neither situation is to my liking, but these are things largely outside of our control. So, my biggest issue with the article is not that someone should stand up for the Chinese Ministry of Culture - but that such a factually inaccurate and aggressively slanted article shouldn't go unchallenged. MW: Some games, like Homefront, were reportedly pressured to change the antagonist of the story from China's People's Liberation Army to North Korea's military force in order to avoid any conflict with various Chinese entities. Even seemingly innocuous titles like Football Manager 2005 came under fire for including Chinese sports teams. AM: Before getting to your questions I need to first knock down the Homefront straw man. It appears the writer used this piece from Kotaku as his source. First off, Homefront was never intended to sell to a Chinese audience. There was no "pressure" from the Chinese government. And being a 360/PS3 game, it isn't allowed for sale in China, regardless of content - just as all 360/PS3 games are banned from sale in China and have been for 10+ years. Next, the suggestion that the "exec team will be banned from entering into China" is ridiculous. As if some Chinese government department spends time researching which Western videogame (which only sell in the West) might offend and then links publisher executives to the title and bans those executives from entering the country? This would be akin to the ESRB (yes, I know it's not a government agency, but you can't go to retail in the US without it) maintaining a list of which Japanese developers participated in the creation of Japanese-only "Schoolgirl Up-Skirt Mosquito Adventure" and ask the TSA to ban them from entering the US. There are numerous instances in the article where the Ministry of Culture (and the Chinese government by extension) is cast as a vengeful, worry-inducing and wrathful agency bent on punishment and blacklisting. This writer (and readers) should examine the regulatory bodies of nations around the world - he'd likely explode in a fit of outrage out how the US DOT handles import licensing on electric vehicles manufactured outside the US (effectively making it impossible for Americans to afford this safe and efficient form of transportation.) Governments create and enforce regulation. So what? Don't like those regulations? Don't do business in those countries.